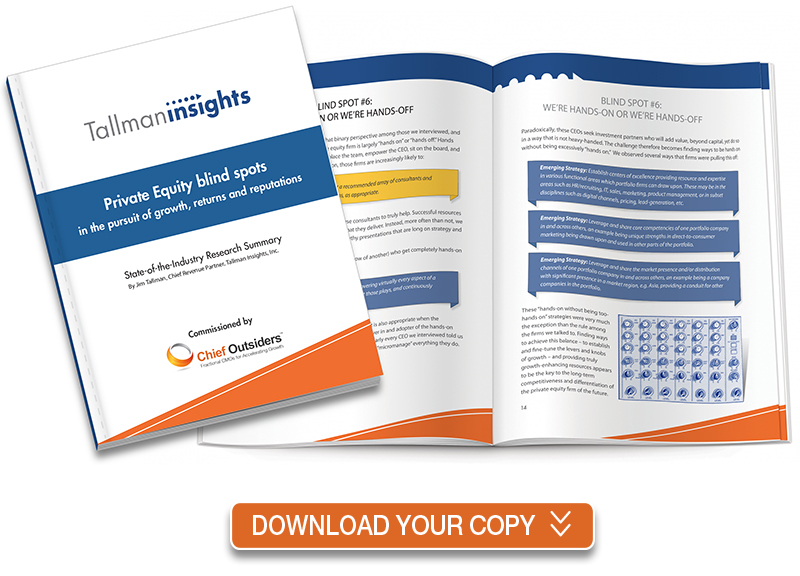 Chief Outsiders Managing Partner Karen Hayward and Tallman Insights CEO Jim Tallman hosted a webinar to identify seven blind spots evident among private equity firms seeking portfolio company growth. An insightful study has been conducted by customer research and go-to-market integration firm, Tallman Insights. The findings were based on extensive interviews with thirty mid-market and lower mid-market PE firm partners, and CEOs of portfolio companies. View the webinar and download the report to learn about the challenges revealed by the new research and the thirteen “Emerging Strategies” for PE firms to consider to differentiate themselves, get more competitive and add more value.